TROOP 23 CELEBRATED ITS 100TH ANNIVERSARY ON October 23, 2010. IT WAS HELD AT BERLIN LODGE, CAMP POUCH , Staten Island. Troop 23 was first chartered in 1910 making it one of the oldest Scout Troops in the Country and also the oldest unit sponsored by a Catholic Church. In 2010 we will celebrate the 100th Anniversary of Troop 23. Whether you were a member of the Troop when it met in Owl’s Head Park, Bay Ridge High School or at its present home of Our Lady Of Angels or maybe just a friend of Troop 23, please take a few moments to share your memories of your time with the Troop here on this page in the comments sectionor email them to me and I will post them here. We hope that this will help us to gather information for the Troop’s Centennial Celebration. If you would like to be added to the Troop mailing list for the 100th send your info to the webmaster and he will pass it along to the Troop. Thanks for taking the time and sharing your memories! 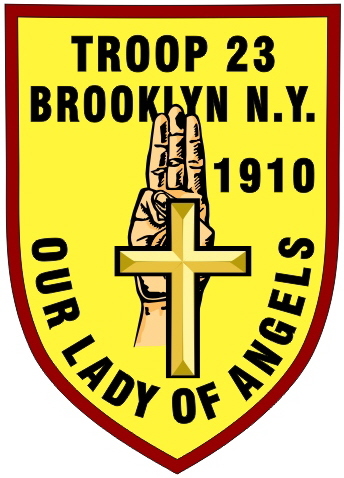 The Boys Scouts of America, and Troop 23, Our Lady of Angels, Brooklyn, New York, both celebrate their 100th anniversary this year. Troop 23 will be celebrating by holding a gala 100th anniversary celebration on Saturday, October 23, 2010, at 7:30 PM, at Berlin Lodge, in Camp Pouch, Staten Island, NY. We would be thrilled if as many former troop members as possible could attend. We do have some bad news though. the event will be catered. We are sorry that you won’t be able to partake of the Scout cooking you were used to as a member, but that’s the way it goes. Everyone would rather reminisce rather than work the kitchen. The good news is that the dinner will be complimentary — there is no cost to you. We will gladly accept any contribution (even if you’re not able to attend), regardless of size, but this is not mandatory. All former Troop 23 and OLA Scouts and Scouters are welcome, and encouraged to attend. Even though there is no charge, we really need an accurate count so that no attendee is disappointed. Therefore, please RSVP by contacting our Troop chair, Ronald Salhany, at r_salhany@msn.com, or write him at 572 Ovington Avenue, Brooklyn, NY 11209. Please do this by October 10th, so we may order the proper amount of food. Please send any donations to Ronald too. We appreciate your interest in the troop, and look forward to seeing you on October 23rd. P.S. We tried to merge our multiple lists, but may not have been totally successful. If you receive more than one copy of this letter, please forgive us.